Somehow I had a spare moment earlier in December, and decided to try to get a head start on my Christmas Sermon. At least for me, this is one of the most difficult sermons to preach in any given year. Emotions run high. The crowds tend to be larger than usual — expanded by folks who are not here at any other time. The children are restless. But most of all, the story is just too familiar. We have heard it so often and we have seen and experienced it both in worship and in the culture in so many ways that the sharp edges of its message for us have been worn away, if not entirely co-opted by forces which have nothing whatsoever to do with this Good News of Great Joy which the angels announce. And so I sat with these familiar images a while and let myself wonder. I wondered about the nature of the peace of which the angels sing, for this is surely a world in profound need of peace. I sat for a moment with the humble place where the child was laid to rest — in a cattle stall — in a manger. And then I went to the beginning and considered the journey which Joseph and Mary are said to have taken to Bethlehem. And though I must have known before, I thought to look again, and sources agree that it is 100 miles from Nazareth to Bethlehem, a path they would have taken over the course of ten or eleven days. Not from Nazareth to Bethlehem, of course, but right here in my own neighborhood, in the communities where I live and serve. I can certainly walk ten miles a day for ten days. It was not the best day to start this ‘walk to Bethlehem.’ While the temperatures had been balmy the day before, this was not the case on this first day. The temperatures had dropped, accompanied by wild winter winds making every step an effort. I had decided it would be best to clock some miles early in the day as it would be a full day later and one which would run straight through with meetings until well past supper time. And while I am in decent enough shape, still five miles at a stretch did not come easy then. By the time I hit the last block or two, I was literally dragging myself home. And yet, my struggle surely helped me to think more deeply about the journey of Joseph and Mary. They, too, must have thought that this forced journey came at a powerfully inconvenient time with her so far along in her pregnancy. Along with that, while they may not have had winter winds to contend with, it was the presence and despotic power of an occupying government which made this journey necessary. And it came to me that if they traveled ten days to Bethlehem, not to mention the emergency trip to Egypt mentioned in Matthew’s Gospel, that Joseph would have been away from his carpenter’s shop for a long time. We understand that the trip to Bethlehem was necessitated because they had to be counted in order to be taxed by Rome and now they would have been even further behind in earning the money to pay that tax. Oh, my walk into the wind on my first day was nothing compared to that. It was still cold and windy on my second day out, but not like it had been the day before. I found myself thinking through a Confirmation Lesson I was planning for that week and about how I might present to them Salvation History as it comes to us in the Old Testament — particularly from the time the people of Israel entered the promised land until the end — indeed, until the very story we ponder this Christmas once more. And so I was thinking of the Judges — those folk heroes like Deborah and Samson and Gideon — and Kings like Saul and David and Solomon and all the rest. 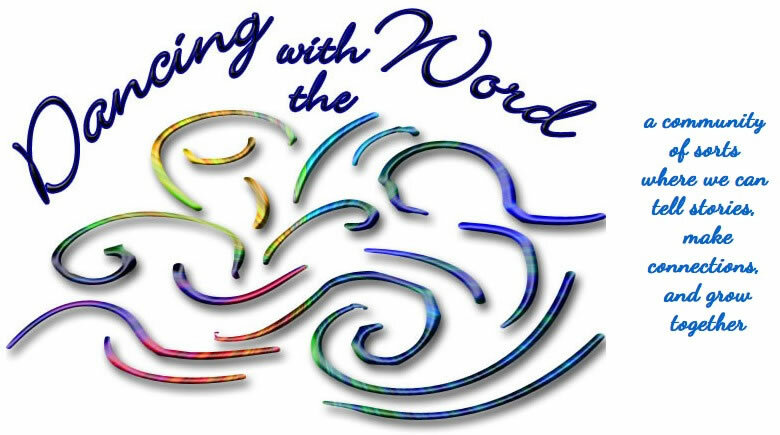 I was remembering the prophets who brought words of warning and comfort both — Isaiah and Elijah, Hosea and Amos. And I thought of how the whole story of God’s work can be found in the Psalms — words and tunes which Mary and Joseph the others they surely must have traveled with probably sang as they covered the miles to Bethlehem. Oh, doubtless the travelers fell silent from time to time, but even as they were literally living under the oppression of Rome, don’t you imagine they kept telling those stories of when their ancestors had been oppressed before and when God had worked to bring hope and freedom? And don’t you suppose that sustained them then even as it sustains us now? I woke up to a skiff of snow today — a first snow, not enough to impede my walk, but enough to keep my eyes on the path before me so as not to hit a slick spot and fall. 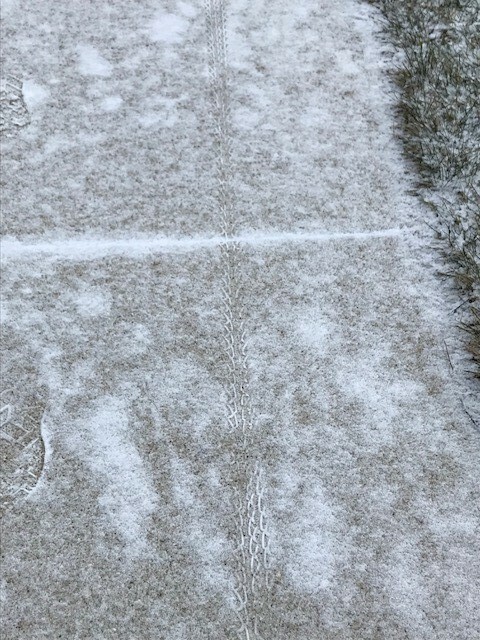 Looking down, this is what I noticed — the footprints of others who had been out earlier than I that morning. 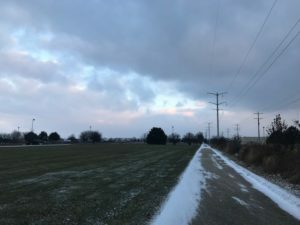 For the first stretch of my walk I was accompanied by two sets of footprints — I would imagine a husband and wife walking together to start their day, much as we imagine Joseph and Mary traveling together those 100 miles. And oh, I do believe that Mary and Joseph must have been strengthened by the companionship of others who took similar journeys before them. Abraham and Sarah. Rebecca who had been barren and then gave birth to Joseph. Hannah who yearned for the birth of a child and was given Samuel, who she then ‘gave’ back to God’s service. The circumstances were different, certainly, but these births were also unlikely. Don’t you suppose Mary was made all the more strong remembering she was not the first? And yet, the point came in my walk when those footprints disappeared, those early walkers having taken a different way home. For yes, it was also so for Mary that her path diverged from all those who came before her. The same, yes, but the life before her and Joseph now was very, very different. Indeed, it would be so all the way to the cross. And I noticed this as well. Once I got back in my own neighborhood the footprints multiplied. Clearly one was walking a dog. And a whole group of children had trampled that light snow at a bus stop. And this. Footprints were joined by bicycle tracks — the chosen transportation of the working poor in my community, making their way to work this early morning. Not so bad in milder weather perhaps — and while not great even then, unimaginable when winter sets in. And I couldn’t help but think that Mary and Joseph would have identified more surely with the one on that bicycle than with me, all bundled up and taking this walk by choice and not out of necessity. I got a late start today and the morning filled up with day off kinds of chores: things like sorting and folding laundry, stripping and remaking the beds, putting bread on to rise and stirring the first batch of toffee for the season to be sold at our annual Sweets and Treats auction this Sunday which will benefit our companion congregation, the Ketumbeini Parish in Tanzania. And yes, while tasks like these bring life and so in their own way are ‘walking to Bethlehem, ‘ I still had actual miles before me by the time I pulled on my winter coat and headed out this afternoon. And it occurred to me that perhaps the songs of other birds accompanied Mary and Joseph on their journey and I wondered if they heard them singing and found themselves humming along, remembering this vibrant promise which was made also to them, for them. And this. As I came to cross the road, a car actually stopped to wait for me as I waited to make my way into the cross walk. As I hurried so as not to make them wait any longer than necessary, I looked up to catch sight of their vanity plate and was flooded by memories of one who had one that was similar. One who died too young and too, too soon more than three Septembers ago. And I thought of all those who share this journey of life and faith with us, who strengthen us with their gifts, their kindness, their joy, our shared hope. And I wondered at what or who it may have been that maybe caught the eye and memory of Joseph and Mary on their walk to Bethlehem — and who it was they might have remembered then who helped shape and nurture their own faith: grandparents, parents, siblings, neighbors, mentors, friends… For Jesus was surely born into a whole community of people besides the two who would raise him. Surely it was not only the ancient stories which would have sustained them on this journey. but the ones held close in their own memories, too. It wasn’t anything ‘on the way’ which captured my attention on my walk this morning. Rather it was this: I wasn’t yet a half a block from home when my phone pinged. It was early yet — just a little past 7 — so I knew if it wasn’t family, then the one messaging me so early was probably bringing troubling news. It turned out to be the latter — a member of my congregation texting to say his dad was in the hospital. I texted back saying I would be there later in the morning. When I got home I called and got the details, got myself cleaned up and dressed, and headed out the door. And I wondered to myself. What would have happened if Mary and Joseph had gotten a message like that? What if shortly into their ten-day sojourn they had received word that a loved one was critically ill? Surely, they would not have had the freedom to turn back for they were obligated to get to Bethlehem first. And I thought to myself of how true this still is for so many today. Oh, it may not be government edict which restricts their freedom to go and be where they are needed most. Rather it is work which one can’t afford to miss, or simply not having the financial means to travel. Surely this has been part of the changing landscape of ministry in recent years where more and more funerals are scheduled on Saturdays when family can get there — no doubt distance plays a part in this with loved ones scattered to places far distance, but even if they are close some cannot come because of work which will not pay if one is not there to work. I found myself in a position not so long ago where this was true — where I was being forced to choose between keeping ‘work’ happy and meeting family obligations. I had the means and the ability (the privilege, yes) to make a change which meant I could do what I knew mattered most. Many do not have this option. Like Mary and Joseph would not have. And so today I was back into my normal routine, attempting to fit in five miles before breakfast. Probably this was not what Mary and Joseph attempted to do as their primary purpose on any given day was to put some miles between themselves and Nazareth, so they likely were able to stretch out it more than I am. 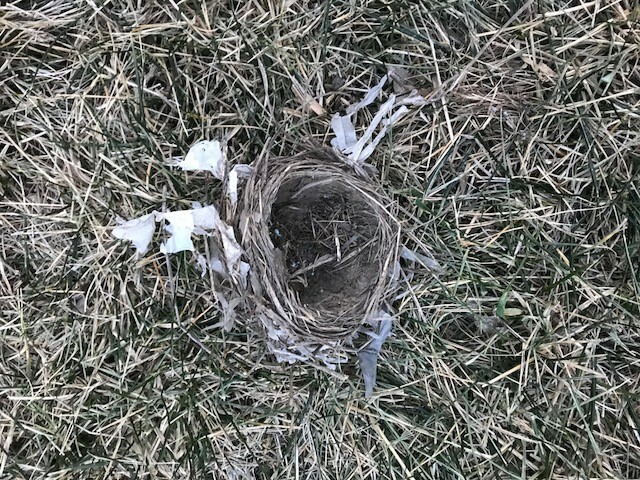 As I walked today here is what caught my eye: a bird’s nest which has evidently served its purpose and had fallen from a nearby tree. Look closely and you will see it is made up of what birds’ nests are always composed of: twigs and straw and mud. Look closer still and you will see that there are pieces of plastic interwoven with all the rest. 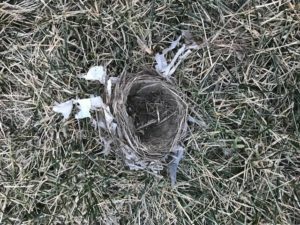 The bird who built this nest used whatever was at hand — garbage even — and turned it into something useful, something which would hold and protect life itself. To our human way of thinking it makes no sense, of course. And yet, we see it to be true literally ‘for the sake of Christ’ in the lives of Mary and Joseph. And yet, we know, don’t we, how very vulnerable, how very fragile these vessels must have been — and especially at this point, Mary herself. Indeed, I remember well standing in a hotel lobby halfway around the world from home with parents anxiously waiting to hear news about their daughter who had minor complications in childbirth. And how we found ourselves unable to breathe deeply until we heard that all was well. Never mind that Mary was young and strong. Things can go wrong and often do. And to think God chose such a risky way to come among us. To think God would use something, someone, as human, indeed, as flawed as you and me to hold and protect the life of his own beloved son. And oh, it is worth remembering, isn’t it, that God always works this way? It is worth wondering, isn’t it, how God might just be using you and me to birth life and hope, joy and sacrifice and justice, for the sake of this world even now? Even you and me in all of our brokenness and fragility and vulnerability. Indeed, even those parts which are weak. Maybe especially those parts. What do you think? How do you see this being so even now? I got out early this morning, a little while before dawn. It had snowed the day before and that made the walking more treacherous, especially in those places where it had thawed and frozen again. I had made it a point to set out my hiking boots the night before. They’re waterproof and have good support and excellent tread. And I thought to myself that it is only because I have the right ‘tools’ that I can even think about taking on a walk like this. I have good solid shoes and warm woolen socks. I have a heavy coat and gloves and hat and scarf. I know to dress in layers. More than this, I am in decent physical shape, although it is so that three days into this walking pilgrimage I was not sure I would be able to continue for my muscles were screaming at me and tightening up whenever I sat a while and then needed to get up again. It was at that point I was in touch with my workout coach who suggested a lesson with a foam roller and offered to loan me one from the studio for the duration of these December walks. So you see, I have this, too. I have community who supports and cheers me on and helps to give me what I need to finish. And there is this. I am innately stubborn. Once I make up my mind to do something, it takes an awful lot to stop me. My dad used to say you can do anything if you have the right tools. Now of course, this is not exactly the whole truth, but it certainly does help. I imagine Mary and Joseph had or were given what they needed not only for their ten-day journey to Bethlehem but well beyond that as well. Some of these came as actual skills, I imagine, but a whole lot more must have been in characteristics developed over time and space. Qualities like faithfulness. Like courage. Like flexibility. Like resilience. Tools, all, which were one way or another passed along and later developed in their firstborn, Jesus himself. And again, how might their community — their fellow travelers — have supported them as they went? And so I wonder now, what tools I have been given beyond hiking boots and warm winter clothes. Indeed, what makes me who I am beyond a stubborn will to accomplish what I set out to do. What ‘tools’ are we given, like Mary and Joseph, which used well may help shape the world in ways that make for life? And how did we receive them and how is it we are called to pass them along? By now I’m getting close to my goal. Today was no easy walk with the wind blowing and the ice beneath my feet threatening to trip me up. This morning our coach, Cathy, reminded us that what we do in our early morning workouts will actually help keep us from falling on the ice. Evidently as one’s core is strengthened, so is one’s sense of balance so that even if you should slip your body will automatically ‘remember’ and keep you from hitting the ground. In fact, this had been so for me just the day before that my feet hit ice beneath the snow and I nearly lost my balance, but was able to catch myself in time. Indeed, it appears our coach may just be right. And so today I walked the path I have been walking for my long early morning walk for the last week. On parts of the path there were multiple footprints in the snow — human and otherwise. And in some places, there were only mine from the day before. Unlike that first journey to Bethlehem, of course, my journey is not linear, but circular. I keep walking the same path day after day, hoping to discover something new about this familiar story of Mary and Joseph, and about myself and my own pilgrimage of faith as I go. Because of this, as long as the snow lasts, I can find myself encouraged by actually seeing evidence that I have done this before and therefore, believe that I can do it once more. Joseph and Mary would not have had this in the same way— whatever footprints they came across would have belonged to other travelers on the way. And yet, I expect that they, even without visible evidence, were able to dig deep and recall other times when they had done hard and important things. Indeed, at a very basic level, no doubt, both of them had walked countless miles before — both physical and otherwise — so they knew consciously and to their very bones that putting one foot in front of the other would eventually get them to where they were going. And yes, I imagine that life had been preparing them all along with other smaller, necessary, life-giving sacrifices so that this one would come a little easier, perhaps. And yet, we know this one is unique — different from all that had come before, for both the burden of what they hold individually and together as well as the hope they carry is that much more profound. Just as all of our journeys look something like ones taken before, but which are always different because we are different each time. And yet, consciously or not, we carry memories of other “walks” deep with us. These certainly help keep us on our feet and moving forward, it seems to me. I can’t know what those memories must have been for Mary and Joseph, but it is worth wondering about for you and me. What parts of your past journeys give you strength, courage, confidence, and hope for where you are traveling today? I had thought I was almost done — just two more ten-mile days to go. And then I got home from mid-week worship and found a deep cough worsening and a fever rising. A trip to the walk in clinic early the next morning confirmed my suspicions. I had the flu and all that would take care of it is rest and fluids and more rest. So I went home and crawled back into bed. Some time later in the day I shared on Facebook my dilemma along with the fact that my ‘walk to Bethlehem’ had been delayed. Before I knew it, three different people offered me their ‘miles’ from that day — adding up to about 15. It seemed a little like cheating to take them, but I did — grateful for community — for others who would literally ‘walk in my place.’ In fact, this has been so in more ways than on just my ‘fictitious’ walk to Bethlehem this week for staff and leaders and others literally stepped in and stepped up to assure that I would get the rest needed to heal enough so that we could finish our collective ‘walk to Bethlehem’ at the end of next week. And isn’t it so that we know the gift of community most of all when we find ourselves unable to be and do what we thought we would always be able to be and do? At least I have found this to be the case for me in these last days. Perhaps Mary and Joseph experienced this as well. I’m still waiting for the tenth day of my actual ‘walk’ and it may be so that I can actually finish off the last twenty miles on my own before Christmas arrives. As for now I am just shy of Bethlehem. Perhaps it is so that I can see it from a distance, but I am not there yet. And maybe it is so that in this life it is rare to actually get all the way to the stable where Mary and Joseph brought the infant Jesus into the world. No doubt it is so that in this lifetime you and I will never stand exactly in the place that angels heralded and shepherds were called to so long ago. Indeed, while our journeys might emulate those of Mary and Joseph, even so ours will never be theirs. And maybe that is the way it is supposed to be. For while my ‘walking to Bethlehem’ this December has helped open up my imagination to what it may have been for Mary and Joseph so long ago, wouldn’t it be even more important to have my imagination opened up to other ‘Bethlehem’s’ today? Right here and right now? To other stables and other shepherds and other heralding angels. Indeed, to others who are as vulnerable as that tiny baby? To have my heart softened and my will strengthened in behalf of those who make unspeakably difficult journeys through life even now? As Mary and Joseph did? To be among those who tell the old stories to a world which needs to be reminded of the strength and courage of our ancestors in the faith? To have a greater sense of how God uses the very imperfect, the so-very-human —- even you and me — to bring life and hope to the world? To seek to be part of a community together which walks alongside and steps in and walks in place of those who cannot? This would seem to be the point of any meaningful walk to Bethlehem, wouldn’t you think? At least this is where and how I will be seeking to allow my heart and mind and will and hope to be opened to in the days to come as we journey to Bethlehem once more. How about you? Beautifully conceived; beautifully written. THANK YOU! Thank you so much for this. What Spirit filled insight. I am blessed each week with your inspirations. I want to take time to thank you and thank God for you. Thanks, JoAnn, for your kind words. Blessed Christmas to you as well! I’m preaching on Mary and Joseph’s journey to Bethlehem—their difficulties and ours. I was very blessed by reading your “walk to Bethlehem.” It opened vistas now readily visible from the Text. Thank you and may God richly bless you! Monty, I’m glad my reflections were helpful. 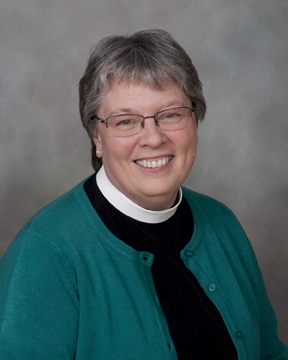 Blessings to you as you preach on Mary and Joseph’s journey!